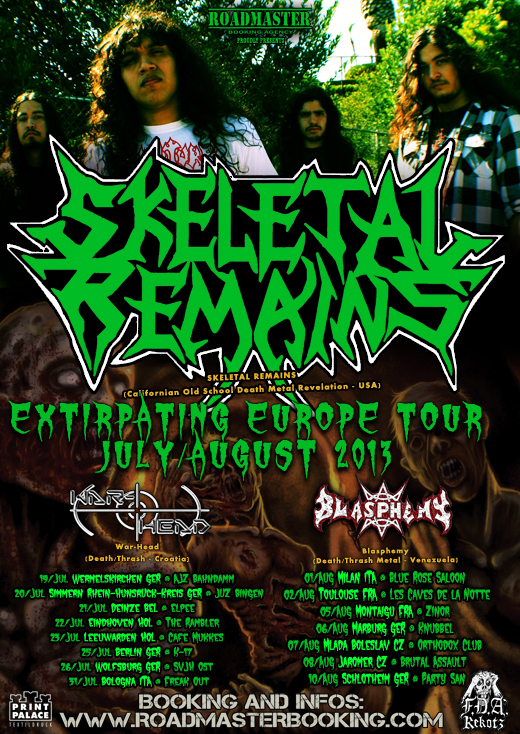 It is with great pride that the agency Roadmaster Booking and FDA Rekotz announces the dates of the European tour of the latest revelation of Californian Death Metal, SKELETAL REMAINS. The tour is the result of the collective effort between the band, the Roadmaster Booking Agency and the German label FDA Rekotz. It will take place in July and August and there will be shows in Germany, Belgium, the Netherlands, Italy, France and the CzechRepublic. There are also scheduled gigs at the traditional festivals Party San Open Air and Brutal Assault. The tour will also feature the Death/Thrash bands BLASPHEMY (VEN) and WAR-HEAD (CRO).